Yesterday we made it back from 2 weeks in Australia. The trip was a success and I feel so blessed to have my family travel the world with me. Leaving on Valentines Day we first flew into Sydney where we walked around the city, Opera House and took a ferry to Manly Beach. 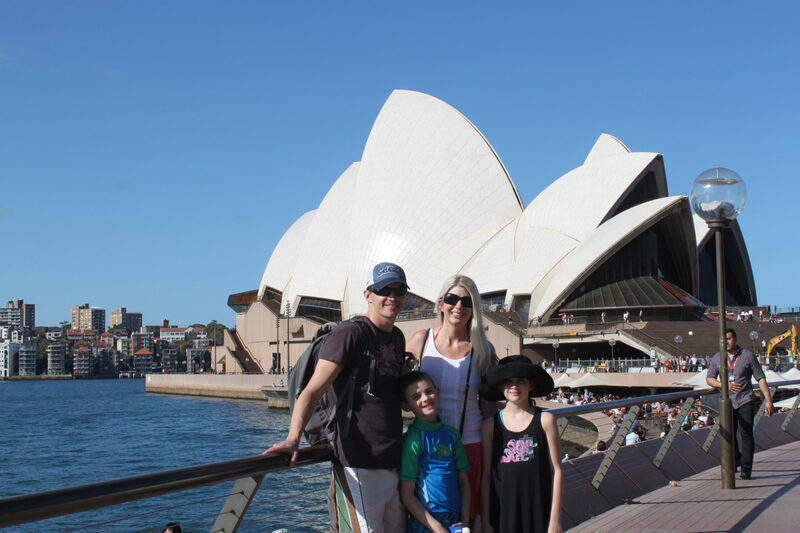 We also saw the animals at the Featherdale Wild Animal Park and then got wet at Bondi Beach. We rented a car so that was exciting driving on the opposite side of the car and road. JoAnna was scared to death but I got us thru the trip unscathed. On the 19th we drove thru flash floods on the way to Thredbo. The weather cleared a bit once we got there but the following day called for cold temps and wind. We woke up, checked the weather and got some breakfast. It wasn’t ideal but it wasn’t horrible…not for us at least since we came from winter temps. We rode the lift to the base of Kosciusko and with our layers of clothing started making our way on the 8 mile roundtrip journey to the highest point in Australia. I asked a few times if the kids wanted to turn back but they insisted on moving forward. It was a great lesson in perseverance for them, which I’m really proud of. JoAnna’s knees went out close to the top but she pushed thru as well. In the early afternoon we made the summit with 12F temps and 30-40mph wind gusts. 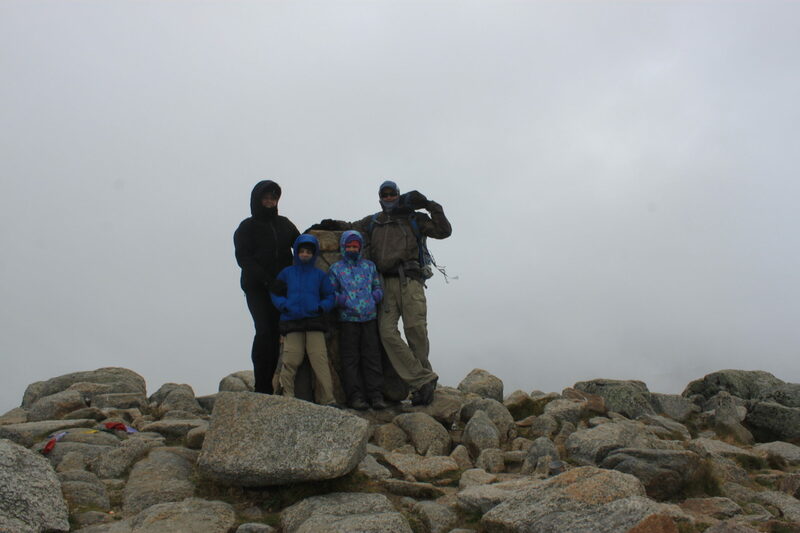 I was so proud to have my family knock out number 7 with me to complete my project of the 7 summits. 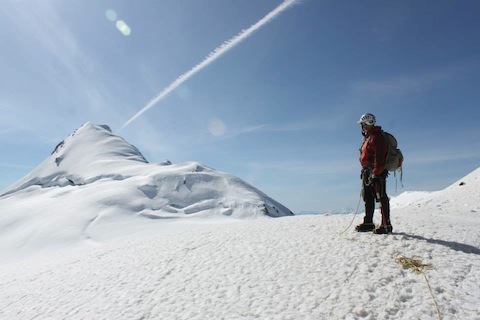 Note – I still need to climb Denali again since my two expeditions have left me 1000′ shy of the summit due to weather. The weather burned off for the descent so we enjoyed a slow walk down the hill. I helped some first responders with a guy suffering from heart issues. The kids enjoyed watching that. We made it to the top of the lifts an hour before they stopped running so we went into the restaurant for a latte and hot chocolate. The view was amazing. We then descended for some hot tub time! The next day we checked out and drove to Melbourne. It’s pretty wild to see all of the wild life as you drive. Kangaroos and wallabies bouncing around, massive snakes slithering across the street, koalas in the trees, echidnas and wombats waddling along. We stopped to ask some kangaroos for directions and JoAnna decided to use an outhouse. As she was preparing to sit she saw a spider the size of her hand on the wall a couple inches from her face. She screamed and ran out, never to use an outhouse again! We spent the next few days exploring Melbourne, the White Night festival, Bells Beach (where we filmed a reenactment of the final scene of Point Break) and Hillsong Church, which was awesome. We left a day early to drive back to Sydney via the coast route (A1). We stopped in Phillip Island to see some penguins then took our time driving, stopping often to take in the views. The crazy thing about the trip is that we really didn’t have jet lag going or coming back. We planned it out pretty well on how to adjust on the plane rides, but we’re all doing a lot better than we expected. Another great adventure in the books for the Dickinson family! 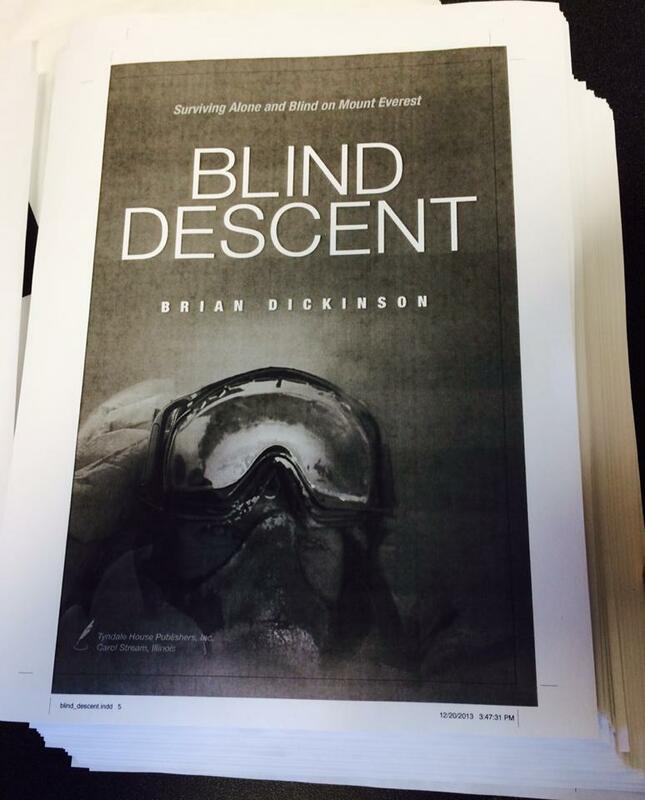 This week I worked with Tyndale House Publishing to finish the picture inserts for Blind Descent. There are some interesting pictures from my Everest climb and one pretty disturbing one of my eyes severely snowblind. It makes my eyes water to see them and remember the pain of trying to sleep that night of 5/15/2011 in the death zone after my blind descent. 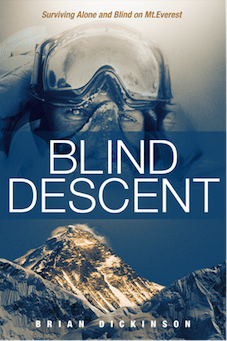 Also later this week I was so grateful to have Erik Weihenmayer, Don Mann and Jim Davidson read pre-released copies of Blind Descent and provide endorsements. I also got some responses from some other high profile individuals that are currently reading the book. It’s humbling to be able to impact others that I look up to. I also spoke with Marketing and Working Title Agency about the book release. They have me booked for Anderson Cooper (CNN) in May plus I’ll be hitting other major circuits on a New York tour. The book will be released the first week of May. Earlier this week I returned from my 3.5 week trip to Argentina. It almost takes more time to acclimate to being home than it does to climbing the mountain. I’ve been ultra busy since my return with book edits, speaking engagements, media interviews and next week I’m being filmed in Denver for a UK TV program on blind climbing. My trip to Aconcagua went smooth with a day of relaxing in Mendoza. We headed up to Penitentes where we got checked in with the park service then stayed the night in a local hotel. The hike in through the Andes was amazing as you can really see the how the mountains were formed in the ocean years ago. They are wind swept with several different types of colors and rock formations. It took 3 days to reach basecamp up the False Polish route. At that point a couple people in the 5 party expedition had some exhaustion and breathing issues. Jason ended up heading out on his own and few days later Wayne walked out. I made double carries each day moving us quickly up the mountain. 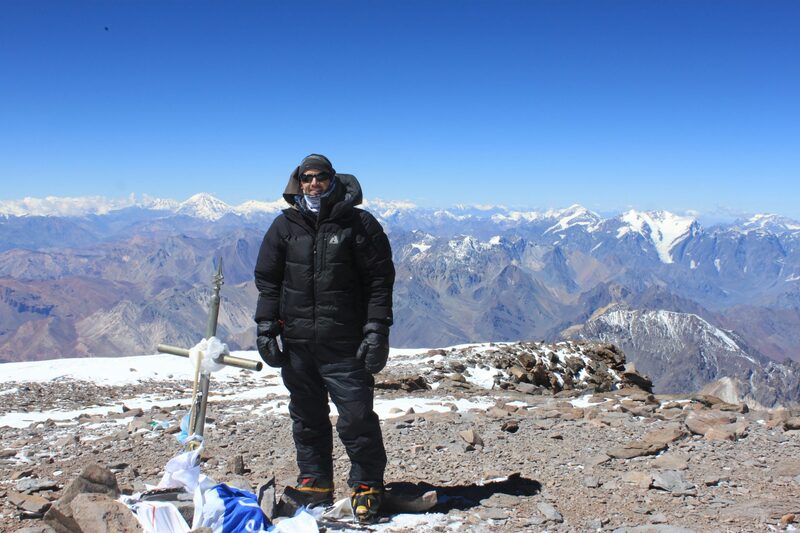 We made a camp I, II (Col), III (Guanacos) and high camp (19,600′). Based on my assessment of the team I decided to solo the summit as we had one calm weather window amongst a wind storm. I set out around 5am on 2/15. I moved efficiently up the mountain and quickly reached the Canaleta, which leads a few thousand feet to the summit. It was slow moving at that point with lots of snow and ice, but eventually I breached the summit (7 hours). I enjoyed the views and the 25-30mph winds. I exchanged cameras with a Polish climber to take each other’s pictures. I then headed down. When I reached high camp the rest of the crew packed up and left me, but also left me a huge heavy bag of shared gear and no stove! I gave JoAnna a call on my sat phone to let her know I was down safe but now had to head down the other side of the mountain, which I hadn’t been before. My pack was easily 100lbs but I started down on my wobbly legs. It took a few hours but I made it down to the next camp where a whiteout storm hit me. I hunkered down for the night and endured the highest winds I had been through (100+ mph). It was so strong that the wind was lifting my tent up and dragging my rock anchors. I leaned with my back against the windward side of the tent all night as the tent poles bent and wrapped around me. I had no water so I stuffed my bottles with snow and placed them in my down sleeping bag to melt about a sip by morning. I was in constant prayer. In the morning I made a decision to get up and move rather than get blown off the mountain. I cached the shared gear as it was too much to carry and headed down. I walked into a storm down the wrong side, which in the end would have ended in the same location…but I wasn’t sure. I saw a couple people descending on the far side of the mountain, hiked back up and followed them down. I was completely dehydrated with no water and after a few hours staggered into Plaza de Mulas. Some drama occurred but I easily neutralized the threat. We then got mules for our gear and hiked out that day. The following day JoAnna and the kids arrived! I stood at the airport very emotional to be safe in Mendoza and to see my family. We had a great week in Argentina experiencing the culture, visiting an orphanage near San Raphael, plus museums, wineries and a bus tour in Buenos Aires. http://seattlebackpackersmagazine.com/everest-solo-climb-brian-dickinson/ I met with Erika Klimecky with Seattle Backpackers Magazine last week and the article came out today. My Dad had a heart attack last week so I drove down to Rogue River to visit him in the hospital. He had 2 major blockages in his heart, which required 2 stents. He’s in good spirit and looking forward to changing his lifestyle. Thanks to everyone for their prayers during this hard time. I leave for Aconcagua in a week and half. I did a gear check this weekend and I’m pretty much ready to go. I’m excited to have JoAnna and the kids come meet me after the climb. We found an orphanage thanks to a friend I found online. We are putting together supplies for the kids! I’m a little over 2 weeks from Aconcagua. I’m super excited for the climb but more importantly to have my wife, JoAnna, and kids, Emily and Jordan, join me after the climb. I’ll be climbing the Polish Traverse for a few weeks and then I’ll meet them in Mendoza where we’ll spend a week, including visiting an orphanage to deliver toys and gifts. This morning I pressed the button to confirm mine and my family’s travel plans to Argentina in February. This will be the first trip of the 7 summits where my wife and kids will be able to meet me. JoAnna traveled to Russia in 2010 and stayed at basecamp on Mount Elbrus, but the kids were too young. Now they’ll be 6 and 9 as I climb Aconcagua. They’ll travel down 2 weeks into my trip to meet me on my descent back into Mendoza. We’ll then visit and deliver gifts to a local orphanage, which will be an amazing experience for all..especially Emily and Jordan. For now I’m continuing my training, which has been light as we head into the holiday season. A year ago I was heading up Vinson Massif in Antarctica…boy was that cold! 09-24-12 | 11:00 amThis past weekend my wife, JoAnna, hosted a COTR Marriage Retreat with guest speakers Don and Jodi Detrick. The event went very well with lots of great feedback. I find that most men would rather have their nails pulled out then go to a retreat but once they go they are glad they went. So marketing is typically focused toward the women, which in turn drag their husbands along. This was certainly the case but all had a great time…so success!This week we continue our chaotically busy lives but will be picking up our newest family member on Friday. 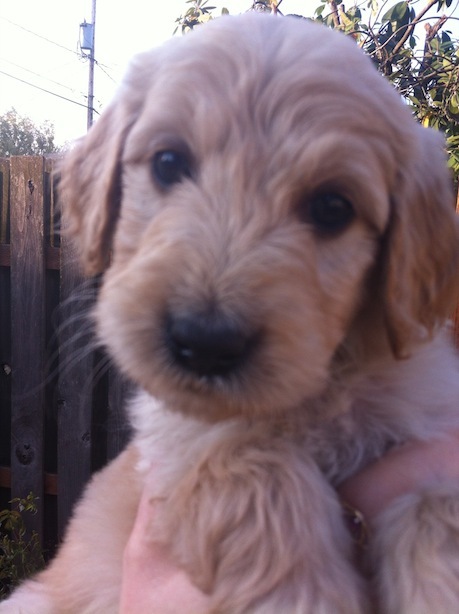 Bella McKinley (golden doodle) will be 8 weeks old and ready to depart her mother (also named Bella). We are very excited since we’ve just had 3 cats (Madison, Sunshine and Moonshadow) for the past years. I’m excited since I’ll have a new companion to hike with. But we’ll have to get through the puppy years. Just when we thought we were done having babies…. This weekend David and I took the kids on a backpacking / camping trip to Mirror Lake. We went to the drive-in movie of Lorax at our local driving range on TPC Snoqualmie Ridge the night prior. Jordan had too much candy and threw up at 2am so I wasn’t sure how he’d do, but he rallied. We went after Emily’s soccer game and hiked the 1.4 miles to the lake. David and my packs were pretty stuffed with all of the gear for the kids but it was short hike. We had a nice time of attempting to fish, which ended up being more adhering to the constant needs of the kids lines getting hung up. But it’s a good test of relaxing and enjoying nature without the constant need to do something. We ate hot dogs cooked in our JetBoil, smores and then woke up to some cold PopTarts! Good stuff! Earlier this week I pulled my hamstring but figured I could rally to run the Skagit Flats marathon. I signed up months ago just to set a goal but was not sure if I would actually do it. I did not train very hard, in fact only ran about 35 miles per week with 2 runs over 15 miles. I am the type of person that just shows up and does it. However I showed up and wished I would have passed. With not running for a week prior and even then barely running since I was climbing with David and friends, I was in a serious disadvantage. I started out strong figuring I would try to break 3 hours but at mile 13 I started cramping. The race was flat but they did not have many electrolyte stations. In fact I only had 1 Gu the entire race, so sucking down water only was not helping my cause. I tried to power thru it but at some point realized that it was a game of survival. The cramps were so severe that it felt like electric shocks in my legs and groin to where I almost lost my balance. I ended up walking and limping in the last 4 miles. I still broke 4 hours and took off over 40 minutes from my last race but it still sucked. I am definitely not a marathoner, I have a lot of respect for the racers but I would rather run in the mountains. This weekend a group of us traveled to the North Cascades to climb a couple 9000 foot peaks, Seven Fingered Jack and Mount Maude. The weather was perfect and we had a lot of successes on the climb. I led the route finding and ended up topping on 4 of the 7 fingers of Seven Fingered Jack. The ridge line was amazing with a lot of exposure to the North. The biggest success came from David Heyting. He has been on chemo for a brain tumor for almost a year. Each month he has his ups and downs due to the meds but you could not tell it on this climb. He did amazing with energy, strength, attitude and appetite on top. This was a great sign of his progress in his recovery! This week I flew down to San Jose to speak at the Cisco Systems GSX or Global Sales Meeting. I closed the session with Chuck Robbins SVP, Americas. I had five minutes to cram in an hour story with a What Cisco Has Done For You theme. As I was about to hit the stage I was told I only had 3 minutes. Somehow I was able to make it work and had a great response from the 10,000 viewers. This weekend we drove up to the North Cascades with friends. We intended to run the 11 mile Cutthroat Classic trail run but we all came down with colds. All of us! We ended up taking it easy and doing some family hikes, which I enjoyed better than a run of misery. Today my family drove down to Portland to join team Defeat Goliath in support of my buddy David Heyting in his battle thru brain cancer. The Portland Brain Cancer walk had 15000 attendees and raised over $150,000 for the cause! Today I led a group of 6 up the DC route on Rainier. We had great weather and the group was really strong, especially for 3 new guys. We made the summit from Muir in 5.5 hours, passing all groups along the way. We had the summit to ourselves for the sunrise. Overall it was a noneventful climb, which is exactly the way I like it! This week is VBS at Church on the Ridge. They had a pirate theme with some great actors plus lots of activities including this zipline. Both Emily and Jordan had a blast climbing up to the high tower and stepping off the long ride below. It is great to see them growing in their faith while overcoming fears and challenges. A few months ago I was auctioned off at a local Christian school. Today I got to fulfill my duty. I took about 15 members of a family on a local hike to Talapus Lake. At the lake I had the kids build a table for my laptop where I presented my Mount Everest summit story. It was a great venue with good interaction from everyone. Afterward the young boys jumped in the lake before our descent. It was nice to hang out with the family and to share my experiences with them. Today Jason Mead and I climbed the Coleman Deming route up Mt. Baker. We had absolutely perfect weather and the views up top were spectacular. If only all climbs could be this nice and uneventful. Early this morning David and I climbed Green Mountain out in North Bend. It was a foggy morning down low but we got above it near the summit. It is a week after Davids chemo treatment but he rallied and made it to the top with no issues. Today was Emilys final swim meet. It was the championship for the swimmers who did not advance to the regionals. We were so proud when Emily won her first freestyle race. She was so far ahead that it even surprised her as she picked her head up to see where everyone was. It was a great confidence booster to end the year with! Summer has been busy with travel and work. I was in PA for a week working on some projects but was able to break away for a bit to see the Liberty Bell, eat a Philly Cheesesteak and see the Rocky statue. This afternoon I worked from home and managed to sneak in a 9 mile run at a 7 minute pace. I will start carrying some heavy loads up the local peaks to ensure I am ready to lead a few groups up Rainier and other Cascade summits in the months to follow. This weekend my family drove 8 hours down to Rogue River, Oregon where I grew up. It is a small town in southern Oregon with a lot of character. I presented my Everest story to the town hosted at the VFW Mayor Bond, who was also my high school principal 20 years ago, introduced me. It was great telling my story to the community as well as old friends from school that I had not seen for a few decades. The next morning was the annual Rooster Crow festival. My family, parents and friends watched the parade and then walked around to see the exhibits. It was like a mini reunion as I ran into several people that I had not seen in several years. Later that evening we drove out to Wimer where I celebrated my 20 year high school reunion. It was great to hang out with the old gang to get caught up. The next day we drove up and went thru the Winston wildlife safari then cut over to the Oregon coast. We stayed in a nice hotel on the water. In the morning we walked out and looked at the sea life and collected shells before heading north along the 101. We eventually hit the Tillamook cheese factory for some ice cream and then over to Portland to visit my brother. We ended up getting back to Snoqualmie near midnight. It was a fun packed weekend for sure. Thanks again Denali Advanced Integration! After a couple of weeks at sea level my feet are about back to normal. I have been able to run a few times and feel ready to get out and climb something. I am looking forward to my 20 year reunion down in Rogue River, Oregon in a few weeks where I will be speaking to the city about my Everest experience. For now I am just enjoying being back home with my family and waiting for summer to start in the pacific northwest. Denali 2, Brian 0. I am not sure what I did to upset Denali but she keeps pushing me back! Dennis and I flew into Anchorage and caught a ride to Talkeetna last Thursday. After the mandatory NPS overview we went to the TAT bunkhouse to catch some sleep. We slept on wooden shelves with the climbers luggage. The next day we did the hurry up and wait routine before finally catching a ride on a small Beaver airplane equipped with skis for landing on the Kahiltna Glacier. The weather was not ideal and we had a close call as the pilot banked right, back left and then climbed straight up to where we almost stalled out, just missing the side of a cliff. I turned on my video camera to capture my last minutes, but for some reason the pilot displayed his skills of near death survival avoidance. After safely landing at base camp we made camp since it was night time, not that you could tell with the 24 hour sunlight. We woke up at 3 am and started moving, bypassing camp I and resting at camp II. The next day we moved our heavy loads to just below Windy Corner. The area we stayed was so solid that we used ice screws to anchor the tent. We slept in and then moved to 14k, where we took a rest day. I was using a split board to skin up and I noticed it was causing bruising on my feet. On day 5 we woke up super early and climbed up the fixed lines to 16k and continued to 17k. I started moving slow due to lack of sleep and the altitude so decided to head back down to rest and acclimatize. It was very painful on the steep descent so I decided to talk to the 14k medics about my feet. The were baffled at what they saw, stating they had never seen anything like it. They also did not recommend that I continue climbing. I had to make a decision, which was not difficult since there truly is no shame in surviving. I told Dennis and he was fine with it since it was the smart thing to do. We packed up and moved down to camp II. And the following day we descended to base camp and flew out. McKinley is a tough climb with all of the weight and distance required to reach the top. I am frustrated to have failed for the second time to reach the top, but I do not question my decision. I went to ER as soon as I returned to Seattle and they said they will be fine in a few weeks but I need to take it easy. Easier said than done. I will pause the 7 summits for the time being so I can spend some quality time with my family during the summer months. Today I am leaving to Anchorage and then catching a ride up to Talkeetna. The snow has started on Denali so I am hoping to be able to fly onto the Kahiltna glacier on Friday to start my journey toward the highest point in North America. Dennis and I will skin up to about 12k and then cached our gear, switching to crampons and axes. Weather permitting we will try to get to 14k as soon as our bodies allow and then look for a 2 to 3 day weather window to move to high camp and onto the summit! Pray for our safety and wish us luck with the weather. This year will go down as another historic season on Mount Everest with 10 confirmed deaths, several helicopter evacuations and massive rock fall down Lhotse Face. With little snow over the winter the rocks did not get glued down like they normally do above camp II. This caused major rock fall down Lhotse Face, which caused one major organization, Himex, to leave with 100 people. It was probably the safest thing to do after all is said and done. With 2 small weather windows most of the groups created a major line heading up the long face to the South Col. Unfortunately they all got in a traffic jam going for the summit and some refused to go back when they had too much and paid the ultimate price. 5 people died during the first summit push. Others are now in position for a May 26 summit, so we should certainly send our prayers their way. Many have asked me about my thoughts on the deaths on the mountain. I typically take a stance of avoidance since I was not there during these tragedies so it is difficult to make a true statement, especially when all bets are off in the death zone. During 1996 we saw several deaths due to the traffic jams but more importantly the weather. This year the weather was pretty good and it really came down to climbing decisions. In the end they were following their dreams and unfortunately made bad judgements. My heart and prayers go out to their families and friends. With less than a week to go before Denali, I made a quick split board trip up past Pan Point on Rainier last night. The conditions were not good and weather came in quickly so I decided to descend. Sometimes it is just good to pack it in and sleep in a comfy bed back home when things are stacking against you. On a more positive note I met with Denali Advanced Integration yesterday. They are excited to help sponsor my climb on Denali. I am excited to represent them since I also partner with them at work. With a little over a week to go before Denali I am busy dialing in my gear and testing my split board with Karakoram bindings. I woke up early and skinned up Silver Fir. With Spring we have had some very warm and sunny days so the sun was pretty slushing on the steeper slopes leading to the top. It made it hard to gain purchase with the skins. I did a gear check with Dennis last week and we are ready other than picking up some food and fuel in Alaska. Today when I got home and was making a latte I realized that a year ago right now I was heading up toward the summit of Mount Everest. It is crazy to think that was a year ago as it seems like yesterday. Right about now I was getting close to the balcony at 27500 feet where I waited for Pasang for an hour. Shortly after that he would be heading back down and I would continue up solo. I had no idea what was in store and the miracle from God that would save my life and get me down safely. I feel so blessed to have gone through the experience, even though it was the hardest and scariest thing I could imagine happening. Less than 3 weeks until Denali. I was in South Carolina all week for work, visiting an Amazon Fulfillment Center. It was hot and muggy in Columbia but I was able to get out in the morning and run 8 miles along the Congaree River. I got back late last night and was able to wake up early to do a weighted carry up the Boulder Garden Loop in North Bend. I saw 2 elk crossing the river as I crossed the bridge just before the parking lot. It is the small things in life that help you pause and appreciate the world we live in. I am borrowing a hyperbaric chamber from a friend. I am curious to see how it will affect my acclimatization on McKinley. I had planned to split board up to Muir on Mt. Rainier this weekend, camp in my new FA Katabatic tent for an early morning snowboard descent but life does not always work out that way. JoAnna flew back to North Carolina to be with family for Rons service and Emily came down with a lung virus and cold. I scrapped the climbing idea and decided to kick it with the kids. We watched Barbie movies and played games. Could not ask for more fun, besides missing JoAnna. A couple days ago my wifes brother in law lost his long battle with cancer. I really enjoyed the time I spent with him and will miss our periodic visits. JoAnna flew back to be with her sister, Julie, and family, Tiana, Johnathan and Tosanna. My prayers go out to them all during this time of grieving. Yesterday I had a good conversation with Bill Reeves from Working Title Agency. We met last year and he was interested in my Everest story. He has had a lot of success with books and movies including, Fireproof, Courageous, Soul Surfer and the recent October Baby. We will have a few more meetings to ensure the paperwork is in place and then if all goes well we will partner together to publish my book, which at this point is titled Blind Faith. With a little over a month to go before my Denali expedition I have kicked it back into gear. I am carrying over 60 lbs on my local hikes, which are a few a week. I am also running and biking for cardio in between. I will pick up my split board gear today from Karakoram and I hope to get up to Camp Muir this weekend to test my kit, including my new First Ascent Katabatic tent. Dennis should be returning from EBC and Lobuche this week. We can then start looking closer at the logistics, gear and training. This past week my family and I flew over to Oahu to visit my Grandma. She is in an assisted living home after having a stroke a few years back. We stayed in Waikiki and visited her each day in Kaneohe. We also spent some time on the beach and I got out to surf one day. It was a nice break from the constant rain we have had this year in Snoqualmie. Now it is time to increase my training for a May attempt on Denali! Dennis and I are set for the end of May to take another stab at Denali. I am working with Karakoram and Jones Boards to demo a split board and bindings up the mountain. It will help on the lower sections for sure since they are a long slog with lots of weight. I also received a package from Mountain House today, which will provide our meals for the expedition. I will look at the new First Ascent tent coming out next week as well. Our goal is to have a small team and travel light and efficient. Dennis is in Nepal right now leading a group into Everest Base Camp. We are both very pumped for this Alaskan adventure! Tuesday I presented my Everest story to the LDS scouts of North Bend and Snoqualmie. It was great speaking to the next generation of boys and their parents. I stayed around for questions and autographs, then raced home to get some sleep before heading to Las Vegas early the next morning. This morning I woke up and drove in the snow to the Raging Rivers Community Church. They had a mens breakfast and I was the guest speaker. I gave my Everest presentation to a great group of men. I then rushed out to run the St Patricks Day 5k with my daughter, Emily. It was snowing and miserable for her but she powered thru it. I was really proud and it was an opportunity to teach a life lesson about focus and determination to reach a goal when things are not going perfect. She was not overly happy along the journey but hopefully she will get it when reflecting on the experience. It looks like Mt. McKinley might happen this May. I am working with Dennis before he heads over to Nepal to lead a group into Everest base camp. It will be just the two of us heading up to the highest point in North America. I climbed it in 2009 but turned back a thousand feet from the summit due to high winds. I met with Karakoram yesterday to demo their split board bindings during the expedition. I will look to get a setup from Jones Boards and Karakoram, which I will test on Rainier prior to leaving. Skinning up the lower areas on Denali will make for a much nicer approach. That path is long coupled with 110 pounds of gear. I should know for sure if we are going in the next week. Exciting stuff! Yesterday I stopped by Bellevue Square to build legos with Emily and Jordan. While in the 2 hour line I told JoAnna that I was going to run into the Eddie Bauer First Ascent store. The store was empty so I went to the back and looked thru the clothing. I overheard a couple talking about an upcoming trek including Sherpa support. I turned around and saw Jim Whittaker, the first American to summit Everest in 1963, and his wife Dianne. We ended up talking for about 15 minutes before I needed to get back to legos. Honestly I was pretty gitty when I showed JoAnna a picture of who I just got to hang out with. In American climbing, Jim is one of the great pioneers that paved the way for so many mountaineers. It was truly an honor to spend some casual time discussing our experiences. There has been a lot going on these past few weeks. The 700 Club called and confirmed that they wanted to send out a crew to film a TV show on my Everest climb. I am also speaking with Bill Reeves from the Working Title Agency about publishing my book Blind Faith. Bill and team have represented Courageous, Fireproof, Soul Surfer and Facing Giants to name just a few. So that is very exciting. I am also working with Tony Russell from 100.7 The Wolf on Transformation 21, which is using Daniels fasting methods to help grow more spiritually. We will be recording a podcast for the website tomorrow. In the next few weeks I will be speaking for Cozi.com and Raging Rivers Community Church. I am certainly looking forward to meeting some interesting people during the next few weeks. This week I was crazy sick after catching the flu while up snowboarding at Whistler BC. I have not been this sick for years if ever in my life. I remember back in the Navy when the aircraft carrier pulled into the UAE and half the ship was sick from eating bad shwarmas. That was a horrible stomach illness that kept me in bed for a week in one of the hottest places I could imagine. This was equivalent or worse. Each day I am feeling better and itching to get up in the mountains. Speaking of mountains, I have been talking to Alan Arnette about leading a small expedition on McKinley this spring. Stay tuned! Himalayan Database They recently updated the Himalayan database for Spring 2011. It looks like I was the only one that solo climbed Mount Everest this season. I certainly did not intend to be the only one on top but that is how things work out sometimes. This weekend I drove down with David and Jason to the SVA Mens Retreat. It was held at Ghormley Meadows, which is a Christian camp. Tony Russell kicked it off on Friday evening with message about finding your spiritual gifts. I spoke twice on Saturday around goal setting and overcoming obstacles. I also had David come up and discuss his current situation around his brain tumor and faith to get through the chemo. Marty closed it out on Sunday with a message on stories and how we all have a story based on our past. Overall the weekend was a great retreat, including snowboarding, good food, extreme sledding at midnight for some and a couple manly movies. Gladiator and Bourne. Merry Christmas everyone! I have not been posting much over the past few weeks as I have a lot of personal stuff going on in my life. I continue to pray for the healing of those close to me. It seems like everything happened all at once, but I have faith that all will turn out fine. I am enjoying the time home with my family through the holidays. I am looking forward to some snowboarding and local climbs with friends in the near future. I hope everyone had a Merry Christmas! I had 5 days to explore Patagonia, Chile since weather prevented flights into the Union Glacier in Antarctica. I rented a car and drove to see penguins and then up north to the Torres del Paine. I hiked around there for a few days and slept in the back of my tiny cramped rental. Last Sat we went through the ups and downs of we are going, not going, going…until finally we were on the 1am flight to Antarctica. The massive jet is run by the Russians and quite amazing to land with full throttle in case we slipped off the icy runway. Similar to a carrier landing. The Union Glacier basecamp is very established since it provides resources for multiple trips (Vinson, south pole, last degree, emperor penguin expeditions) and scientists, film crews, etc. we did not stay long since we took a twin otter outfitted with skis up to Vinson basecamp on the Branscomb Glacier. My team was small, just 3 of us. We took no rest days and immediately headed up the hill. We moved 60 lbs to camp I and then up the fixed lines to camp II the following day. On the third day we made our summit attempt. It was a long day but we pressed on thru the -32c / 30 knot winds (-70f). It was so cold that during breaks when my body stopped producing heat my fingers froze solid. I had to respond quickly to warm them and avoid frost bite. I got a little frost nip and wind burn but it is temporary. The summit ridge was the most beautiful I have seen to date. It looks similar to everest with a wind cut ridge, but seems to go on forever. We took a few pics and then got back down. The descent was long and we were exhausted when we hit the tent. The following day I descended to basecamp while the rest stayed high for another rest day. I wanted to get down and out since a couple family emergencies occurred while on the mountain. it was Thanksgiving and I had a steak dinner with the basecamp manager. I was fortunate to catch a flight off of Vinson and then back to Chile. However when back in Punta Arenas JoAnna (back home) and I spent 13 hours on the phone with airlines trying to change my flight. Apparently in Santiago on my flight in 2 weeks prior they had no record of me getting on the flight. They had no record of my existence although I had bags checked, walked thru security and flew in their plane. I told them that should be a major security concern. Without record of flying I could not change my flight or get back home on the return. So I ended up purchasing a new one way ticket home for $1700 and figured I would deal with trying to get a refund when safely back in the states. Now I am back here and enjoying the time with my family. On another note, my good friend, David Heyting, had a tumor removed from his brain while I was gone. He is recovering now and will find out more info from the Dr. tomorrow. Prayers needed! With one week to go before my Vinson expedition I am packing and planning. The load will be similar to Denali but with new clothing modifications like a down suit. Temps are negative 40 there now but hopefully we will get some warmer weather. Plan for the worst and hope for the best. Guideposts sent me three December magazines today with my articles. I am in there for my Everest miracle as well as a little article on my family and venture. I will post the article on this website, Facebook and Twitter when it becomes available to the public. I am not planning to blog until after my expeditions so wish me luck! Last week my family and I were in New York City. I had training for work but used it as an opportunity to bring the family out. We stayed the weekend and enjoyed the sunny and snowy east coast weather. This week we are back in Snoqualmie and doing some last week preparations for my trip to Antarctica. I will fly to Raleigh next week to give another Everest keynote speech for an INX conference, visit family and then fly down south for my expedition. It is coming quick but I am physically and mentally prepared. 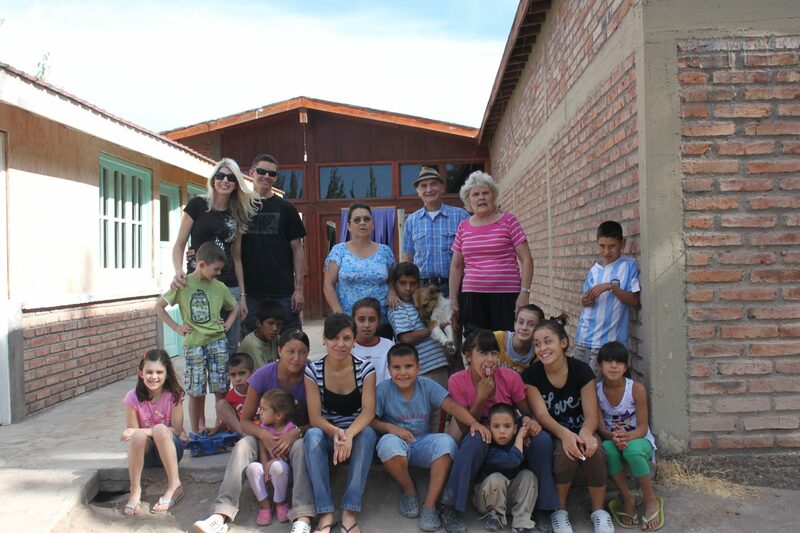 I also have an orphanage in Punta Arenas that I will deliver toys and gifts to. Today Rick Wood, owner of Cascade Mountain Tech, provided new graphite trekking poles and sponsorship funds for my Vinson trip. I look forward to showcasing his product durning my climb. Less than two weeks to go. I sent off and confirmed my Mount Vinson expedition for next month. Now I need to get my flight and fill in the gaps prior to the trip. Stress! Back from Boston where I gave a keynote speech for an INX conference. It was nice visiting with friends in Boston and New Hampshire. Plus we boiled some live lobster one night for dinner. 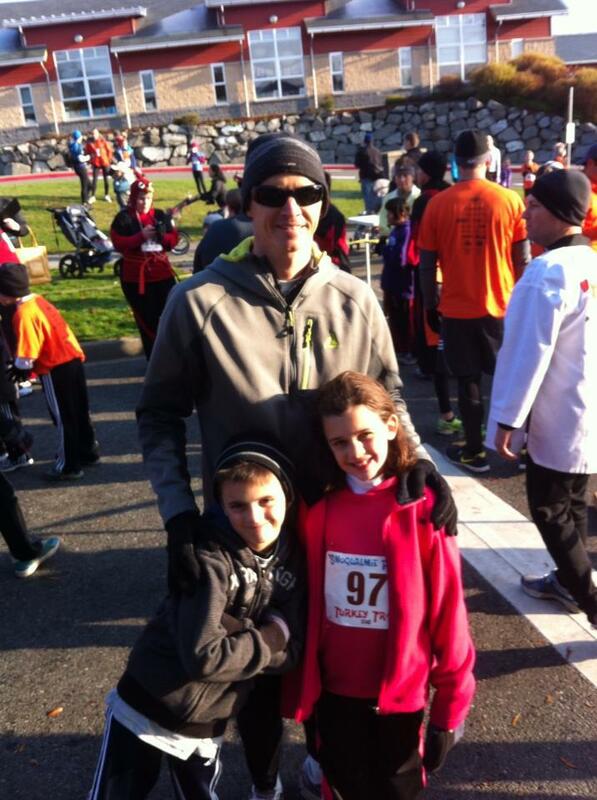 Today Emily, my 7 year old daughter, and I ran the Snoqualmie 5 mile trail run. She was the youngest runner by over double her age, which was very impressive. She never backed down and maintained a great pace to finish the race in just over an hour. I could not have been a more proud daddy! Tonight I flew into San Diego where some friends from the Navy celebrated Kevin Houstons (SEAL Team 6) life down on Coronado beach. It was great to all get together to honor our fallen brother. He is truly missed. Yesterday I flew into Denver to film my Everest story for Cisco Systems. We will be using it as a motivational speech for the enterprise west fiscal year kickoff. While there I drove over to Boulder to hang out with the No Limits and Modern Gypsie teams for the finale of Expedition Impossible. I met some great people and we will most likely link up to climb in the near future. Today I soloed Mount Shuksan in the north Cascades. It is perched right next to Mount Baker so it exhibits spectacular views. It was a perfect day and I bivvied on a cliff overlooking Baker. Shortly after 5am I took off on my own and was on the summit to watch the sunrise. The summit pyramid was a little sketchy without protection, but I made it up and down without error. I would definitely put Shuksan as a classic climb of the Cascades! Tonight was perfect weather for an Extreme Adventures rappelling event on the Boulder Garden Loop near Little Si. We had a good turn out and some first timers. All went well with nothing but smiles for the descent. Today the world lost a great husband, father, athlete and friend. I served in the military with Kevin Houston while at HS2. He then went on to become a Navy SEAL. After multiple tours protecting our country and earning 2 bronze stars and a purple heart, his helicopter was taken down by enemy forces. 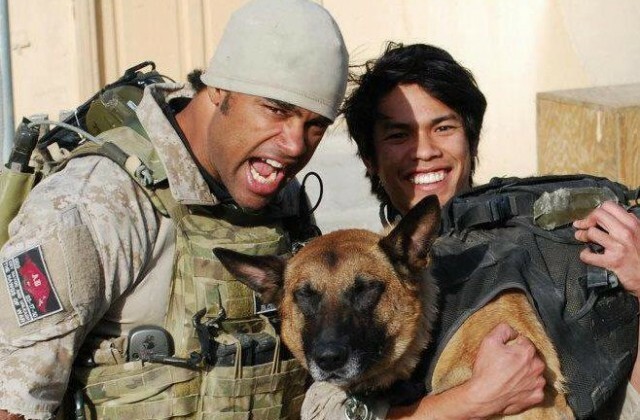 He and the other SEAL Team 6 members, plus other SEALs and service members lost their lives after performing a heroic rescue mission. Kevin was an outstanding person and friend, he leaves his wife Meiling and 3 children behind. He will surely be missed, but heaven is certainly a better place with him in it. INX recently flew me to El Paso, TX to be the keynote speaker at one of their conferences. The picture below is a footprint image of which they had several leading the way into the Marriott to our conference room. Very creative! The event went great and I had a lot of positive feedback of inspiration after my talk. INX also announced that they would help sponsor my next climb, will donate to the AIDS Research Alliance and wants me to be the keynote speaker at a few more upcoming events! I cannot thank INX enough for all they have done for me in helping my dreams become reality. David and I climbed Humpback Mt. early this morning. The route was pretty good but steep straight up to the 5200 foot summit. The weather came in so we did not have views and decided to head down. Halfway down I slipped off of a fallen tree and went head over heals. I landed on my head with my body contorted and heard a loud crack. I am now pretty wrecked with major neck and shoulder pain so I will see a doctor later today. Hopefully it is nothing major. Always something! Early this morning Dennis, Matt and I drove out to Snoqualmie Pass to climb the Tooth. We took the winter route in and were surprised to see so much snow this time of year. We blazed a trail and then climbed the steep gully filled with ice. We did not bring crampons since you really should not need them this time of year, but we wished we would have had them. When we got to the base of the Tooth we saw about 9 people waiting to climb the multi pitch route. So we decided to just make it a day hike and head back out. I slipped on the top of the gully and ended up glissading down, which was cold and wet but a quick way down without injury. We did not get the rock climb to complete the Tooth but it was a beautiful day for a hike. Guideposts magazine contacted me today to let me know they found my story of inspiration on Everest on the Internet. They are interested in writing a story in their magazine for a next years edition. I cannot say enough how awesome God is to work through me to help inspire others. Today Dennis and I gave the Fathers Day message at Church on the Ridge. We spoke about our Everest account and how God played the major role in my survival. Today 6 of us climbed up the DC route on Mt. Rainier. It was crazy hot on the Muir snowfield. We camped at Muir and then geared up at midnight. 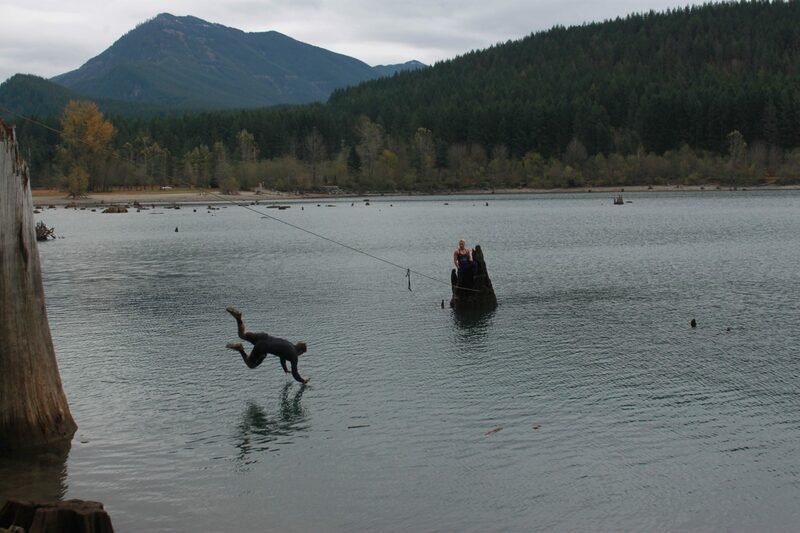 David and Kenny decided to stay back due to nausea so I had Collin, Matt and Jessica on my rope. We headed up in the warm night and at the top of the cleaver the weather really came in. 30mph winds covered our snow tracks immediately and the visibility was very poor. We turned back around 27,000 ft along with all guided groups. We packed up and headed out, where we got soaked from the rain. My feet were pretty wrecked from wearing my Millet boots on Muir snowfield. End result is everyone made it safely off the mountain. A few days ago I had to say goodbye to my family before leaving for my Everest expedition. It was the hardest thing I have had to do, but we got through it and I just now got off of a Skype call with JoAnna and Jordan from my hotel in Bangkok. It truly makes a difference to have the real time video interaction. I leave for Nepal in a few hours where I will be able to test my 3G connections. The satellite place messed up my order so I will have to completely rely on 3G during this trip. Tomorrow is the orphanage event so I have a lot to do in the next 2 days in testing the technology and coordinating the last minute logistics of the event. Today Pastor Charlie at Church on the Ridge had Dennis and me go to the front stage with JoAnna and our community group and friends to give us a prayer before our departure. I am the type that would rather stay under the radar and just go do my thing. I think it is a defense mechanism to avoid getting overly emotional. It has been a tough week ramping up for departure and trying to assure the kids that I will be safe and the time will go by quickly. I have now reached the point where I am ready to be there and focused on what I am out to do. It is tough leaving no matter how much planning you do so it is better to be there and working toward getting back. I do appreciate everyone and their warm prayers and support. I truly feel blessed to have such a great family and great friends. 3 days before departure and I am feeling the calm before the storm. There is plenty left to do in testing technology, packing and trying to get my bags to come under weight, which will be impossible. I spent yesterday at Emilys class helping out as a part of the Watch DOGS program. I was surprised to get a medal and a book of written encouragement from Mrs. Heinzs class. My wife, JoAnna, came in and filmed it all on our Flip video. She must have been tipped off on their plans. It really meant a lot to me. I then sat in front of the class while all of the children asked me questions about Everest and climbing. Of course word got out so I also sat and spoke about other climbs and Everest to 2 other classes. Out on the playground all of the kids kept coming up and wanting high fives or wanting to tackle me or just probing for more info. It was awesome to spend the day with Emily and I know it meant a lot to her. Today I will be packing and spending quality time with my family. Today David Heyting, Matt Baker and I climbed Silver Peak. With tomorrow being the first day of spring we can officially call this a winter ascent. We carried our snowboards to the top of Hyak and cached them for the ride down. Then we snowshoed for about 4 miles to the base of the mountain. From there is was deep side traversing through the PCT and then we climbed. It was pretty steep with heavy snow sticking to our snowshoes for the last mile straight up the mountain. Toward the top we encountered some sketchy avvy conditions with cornices just looking for a reason to kick off. I led the way up, making some steps, but it did not help much since each new impression went deeper into the snow. We made a false summit at 5400 feet and determined our best approach since the entire summit was blocked by large cornices. We donned our beacons and traversed sideways to a safer route and then headed toward the summit. We ate what we brought, which was not much, and then headed back down. We tried to reverse our path but found it was easier to hug the sides of the avvy gulches for the descent. No slab layers broke loose so we did not have any questionable issues. The journey out was long but we eventually made it to our boards. A quick board down and we called our wives to inform them of our safety. The trip was a little over 13 miles, 9 hours and 4500 feet of gain. It was a good day! With 2 weeks to go I decided to start staging and packing for my expedition. It is really tough to plan out food and snacks for a 2 month camping trip. But I figure I can always give extra food to the locals. I should receive my Cisco Cius this week and then I will be able to test the entire setup. Now it is just about final logistics, timelines, tapering my training and most importantly spending time with my family. Today was a very rainy St. Patricks Day race. My son, Jordan, ran the 1k with my wife, JoAnna. And Emily and I ran the 5k. She did so great and finished 3rd in her age group (7 years old). I am so proud of my family! 3 weeks to go. Prior to a multi-week expedition a lot goes through ones mind. Planning the logistics can cause a lot of stress, but having a list with timelines and milestones to check off helps balance the sanity. Emotionally, leaving the family for 2 months is the most difficult thing affecting me. I find myself constantly dealing with the natural fight or flight feelings. I am so close to my family that being away will be very difficult. I will put all of the provisions in place, financially, technically, communication, etc., but it does not make it any easier. I know in the long run it will all be a blur, but the lead up anticipation is tough. Especially with the kids being so young. They think it is cool that their Daddy climbs mountains but they do not really understand why. I do not really understand why so explaining to them is a challenge. I am sure later in life they will get it, but for now it is just really important to openly discuss it with them. With less than a month to go I am busy with logistics of both work, events and teh actual climb. This week I got my Cisco 819 ISR router, which has 3G technology and my Cisco 3502e AP. I used my Iphone 4 3G SIM card to test connectivity, which should be similar to Nepals NCELL. In fact I am posting this blog via the entire setup. I should receive my Cisco CIUS tablet in a week or so. At that time I will setup the entire architecture plus plug it all in via my Goal0 portable power units. As each milestone is met I feel a little more at peace. It will be hard to be away from my family, but it will be nice to actually be in Nepal and working toward my ultimate goal…getting home. Today I brought my Extreme Adventures group on Mt. Rainier. The weather and avvy report looked good for a perfect climb and snowboard descent. However high winds, cold and blizzard conditions came in quickly. We snowboarded down some sketchy areas and hiked out through some deep areas. Some of the team climbed down the trail but with heavy snow and low visibility it was getting difficult to find the way out. All of the boarders and skiers made it down. I then dropped by snowboard, switched boots, grabbed my avvy rescue gear and headed back up the mountain. I was fortunate to find the last of the climbers only about a half mile up. All in all it ended well, with a quick dose of reality for the group. Things can happen quickly on the mountain. Today I climbed Mt. McLoughlin down in Southern Oregon with Zach Urness from the Grants Pass Courier. We took off around 6am and hiked through the forest for 2 miles until we could see the 9k peak. From there we encountered some wind but continued heading up. We made the summit around noon and then headed down, glissade style. The mountain was not too technical but the view was great since it is the highest free standing volcano in Southern Oregon plus we had great weather despite the wind. Today I gave a goal setting presentation to Rogue River High School, where I graduated 19 years ago. I went through my military and mountaineering slides then left some time at the end for the students and teachers to ask questions. It went well and I really enjoyed being back where it all started. I also challenged the students to write out their short and long term goals and email me their successes in 6 months. 2 months to go! The logistics of Mt. Everest are pretty crazy. I have all of my gear and plan tickets. Now I am working with various groups at Cisco, INX, schools and Church on the Ridge to coordinate live video feeds. I am also speaking with a magazine for blog updates. My training has been about the same with 3 early morning weighted climbs plus runs each week. I try to carry 60lbs for at least 5 miles with a couple 1000 feet of gain. Today the University of Phoenix magazine cover story came out. I thought it captured my venture very well. They will be releasing my story to the local Seattle media as well. December in the Pacific Northwest brought lots of lower rain and heavy snow up high. I have been training non-stop with early morning weighted climbs mixed with a couple 6 mile runs per week. Every other week I try to get out for a longer climb on Rainier or in the Olympics. Logistically getting ready for Everest is a bit overwhelming. I have all of my gear including my First Ascent down suit, but I still need to get my plane ticket and figure out food and living supplies. I will be showcasing Cisco technology and doing live web feeds to schools and sponsors. It will be ultra tough being away from my family but it will be nice to start the expedition in April, with all of the planning behind me. Happy New Year! Today a group of us climbed the 13 mile Tenerife Mountain. It was very snowy up higher and we took the Kamikaze route. This morning I woke up at 4am to climb the Haiku Stairs in Oahu, HI. The Haiku Stairs or Highway to Heaven was built during WWII for a military lookout. It is about 4000 stairs to the top of razor sharp peaks in the middle of the island. It is off limits and they guard it from 6am to 6pm, which is why I woke up early to climb it. I kept my headlamp off as to not draw attention to me climbing straight up the face of the cliff. It was an amazing sunrise from the top and I got down before the guards showed up. Today 4 of us went out East to climb Alta Mountain. It is located out on Snoqualmie Pass. It is just over 6000 feet and 12 miles roundtrip. It was not technical but a beautiful area to climb. Plus toward the summit we got hit by a blizzard, which was a nice surprise. Today I was on KDRV Channel 12 ABC news down in Southern Oregon. They made me the Amateur Athlete of the Week. It was a 3 minute segment on my climbs, the orphanage visits, Extreme Adventures and my partnership with the AIDS Research Alliance. The link is on the homepage. Today I ran the 5 mile Snoqualmie trail run. I came in 3rd overall and 1st in my age group. The kicker is I wore a red cape the entire race! This weekend I led a group of 5 training for Denali up the DC route of Mt. Rainier. It was pretty windy at Ingraham Flats where we camped so I ended up cooking inside of my bivvy, which gave me a bit of carbon monoxide poisoning. I felt the effects the next day around 13000 feet. It was a rough climb but I powered through it and we all made the summit. It was short lived as the winds really picked up on top. I was supposed to meet my Extreme Adventures group to climb Mt. Adams that same day but decided against it based on our late descent. However David Heyting was able to get everyone to the summit of Adams. All ended well! The family and I took a quick trip to Cannon Beach, Or this weekend. I was able to get a day of surfing in. However we got our car broken into and my wife had her purse stolen. It was disturbing to be the victim but we used it as an opportunity to teach the kids a lesson about forgiving those that hurt you. It was certainly a tough lesson but God gave us a challenge that we hopefully responded adequately and grew from. Always easier said than done. This weekend I ran the Cutthroat Classic 11 mile trailrun at the Cascade Pass with David and Jessica. I had a very good pace but took a good digger at mile 8, which could have used stitches if there was any flesh left to stitch. I still finished 7th in my age group, but was pretty bummed to take a fall. Today me and 3 others climbed Russian Butte. We camped high the night before and then continued an early morning bush wack over 17 miles with 3 5000 foot peaks. David and I made the final attack on Russian Butte since it was a pretty good rock climb to the top. The views were spectacular but we did not stay long since the other 2 were down below. We found a different route with plenty of veggie belays to get us down. It was a long day with a lot of ups and downs plus some bee stings. It is one of the hikes that you do once. Last night we returned from our 10 day journey to Russia. We got in late but went in to see the kids as they were sleeping. JoAnna and I missed them terribly during our trip and are thankful that they enjoyed their time with Cynthia. Our trip started in St. Petersburg where they lost the majority of our luggage. We spent the days walking around the town looking at the architecture and museums. We also took a couple boat tours and watched a Russian ballet, Swan Lake. We then took the train to Moscow for a day and then flew down to Mineral Vody. We took a 4 hour van ride to the base of Mt. Elbrus. We took the lifts up to the barrels at 12k where we stayed the first night. JoAnna stayed all 4 nights in the barrels while the rest of us climbed up to high camp at 15k. We then made an early summit push the following day. The weather window was perfect and we made good time to the summit. The descent was gorgeous as the clouds burned off the surrounding Caucasus range. I was excited to see JoAnna when I returned to the barrels. David and Oleg spent another night at high camp then descended the following day. We then spent a couple days in Azau before flying back to Moscow. David, Jessica and Oleg did a climb on the other side of the mountains while I did a solo climb up to 10k closer to the hotel. We flew back to Moscow the next day and then back to the US on Tuesday. The flight time was long, but we forced ourselves to stay awake to help reduce the jetlag. We are all glad to be back and excited for our successful climb and great memories made. Tomorrow JoAnna, David, Jessica and I fly to St. Petersburg. We will spend a couple days there then take a train to Moscow and fly to Mineral Vody where Mt.Elbrus is located. We are planning on 5 days to climb the 18,500 ft. peak, but are hoping for a quicker summit bid. We will then spend a couple days in Moscow before flying home. We are excited for the trip but will definitely miss our kids, Emily and Jordan, while we are gone. Wish us luck! This weekend we did an acclimization climb up Little Tahoma. Little T is the 11k peak off of Mt. Rainier. I climbed up to 8k with my wife, JoAnna, then climbed down with her and back up solo that night. Me and a few friends then took off for the summit at 6am. It was a long day, crossing multiple crevassed glaciers and various rock climbs. But the summit was amazing with a lot of exposure on the Emmons side. This weekend my buddy Will flew out from Tennessee to climb Rainier with me. However the weather was not very good and avalanche danger was high, so we went out East to climb. We targeted a 2 day climb to Mt. Stuart traversing the Sherpa Glacier. The conditions were not ideal with waste high deep snow and 50 plus degree angles. We climbed up the 3000 vertical feet to the top of Sherpa Glacier then descended. It was a great trip despite the conditions. Today I solo summited Mt. Hood up the Hogsback route. The weather was great but I moved pretty effiently to avoid avalanche hazards after a week of heavy snow. I was the first person to reach the summit, enjoyed the sunrise and then headed back down to Portland where I visited with family for Mothers Day weekend. Today I climbed Mt. Shasta as a part of a story for the Grants Pass Courier. Zach Urness came along for climb. The weather forced us to go up the Green Butte ridge due to lower avalanche concerns, but the summit day weather was perfect. Today the Extreme Adventures group went up to Camp Muir at 10,000 ft. on Mt. Rainier for a snowboard and ski ascent. Everyone had a great time! Today I returned from my Tanzania trip. Joe, Jason and I all summitted to Uhuru Peak on Kilimanjaro 19,340 feet on Wednesday morning. It took us 3.5 days to climb the mountain with a 1.5 day descent. It was an amazing climb and we had great weather. We then stuck around a day for a safari in the Arusha National Park. 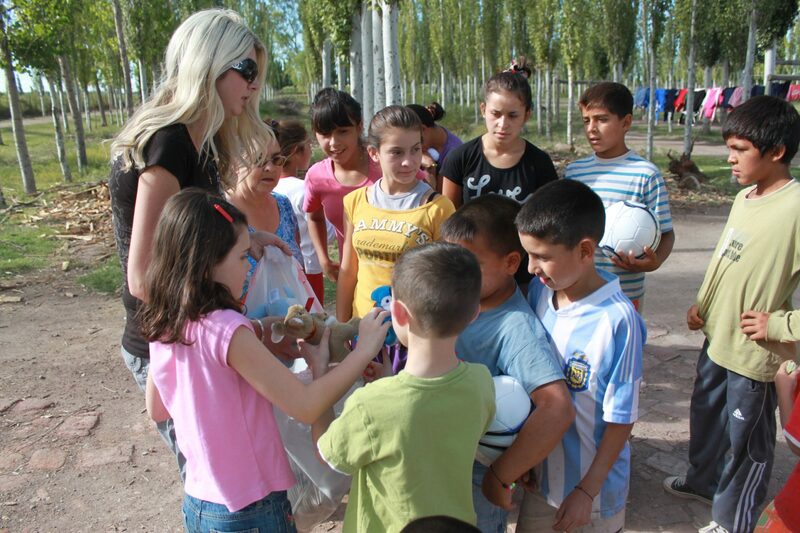 We ended the day with visiting some poor areas as well as an orphanage to give away toys we brought with us. Tomorrow morning we head to Tanzania. The flight will be over a day long so I am not looking forward to that. But the climb should be good with good friends from Portland and Ohio. Wish us luck! Today we hiked up to Camp Muir on Mt. Rainier and snowboarded down. Camp Muir is at 10,000 feet and has massive snowfields of great snow for boarding. The visibility on the way up was really bad, but a lot of it burned off for our descent. It was a great time! 2 weeks to go for Kilimanjaro! We have most of the logistics worked out. Now it is time to continue our workouts to build our cardio. Tomorrow I am climbing up to Camp Muir on Mt. Rainier and snowboarding down. Jason is climbing halfway up Mt. Hood on Sunday. And Joe, well there is not much climbing in Ohio. Joe, Jason and I are gearing up for our February 5th departure to Kilimanjaro. We are all working on our cardio since it is more of a marathon rather than a weighted or technical climb. Today is my daughters 6th birthday. We had a great princess party for her. I cannot believe how quickly she is growing up. Where does the time go? I have been talking with a local guy and we are going to start planning our 2011 Mt. Everest Expedition. There is a lot of logistics and costs associated with the climb so it will be a busy year to ensure our success. More to come. I decided to get a group of friends to climb Mt. Kilimanjaro in February. We all bought our tickets and I reserved the local guiding service. We will be climbing February 5 – 12! 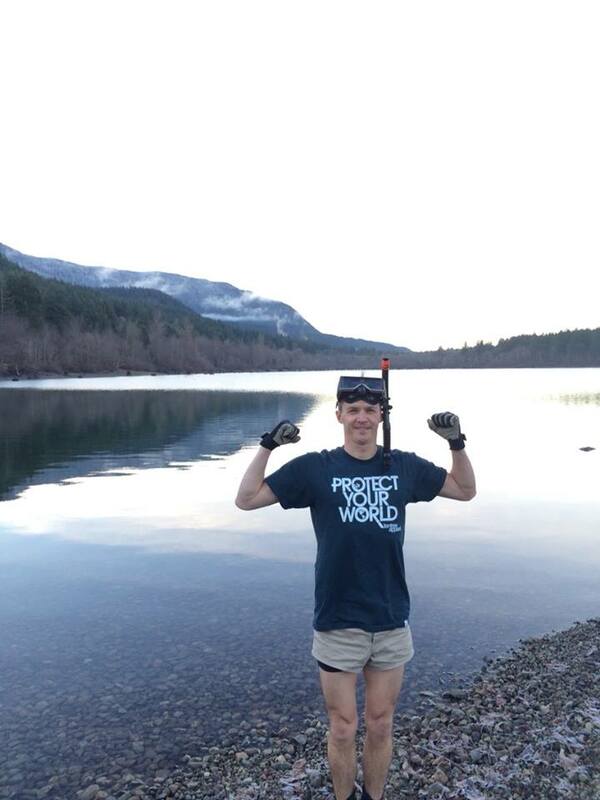 Today Extreme Adventures put on an 11 mile trail run in North Bend, WA. We had a good turnout despite the wind and rainy weather. This weekend Extreme Adventures did the 18 mile hike across the Enchantments. We had a little snow on the top of Asgard Pass but for the most part the weather was good. The larches were out so it was quite beautiful. This past month has been filled with a couple Adventure Races. 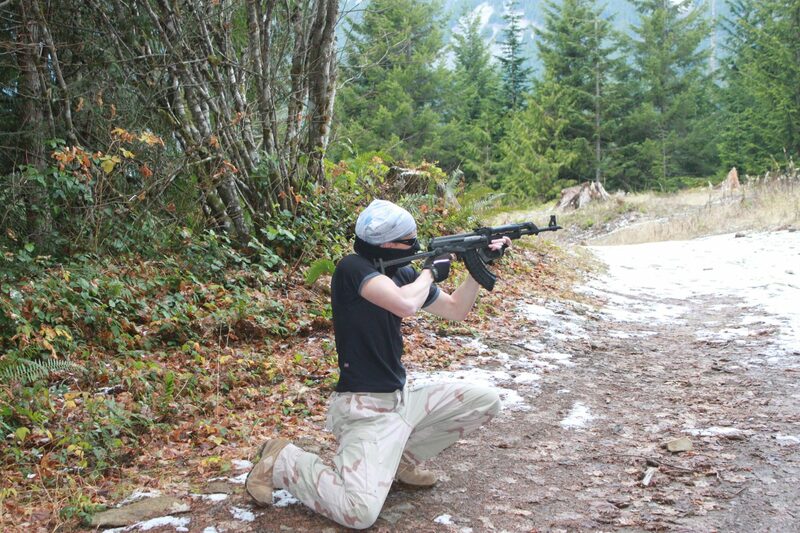 The first was the Beast, which is a local AR. It was in Renton, WA and about 3 hours of mt. biking, trekking and navigating. The second was last weekend, which was the Trioba 24 hour race. It was in Plain, WA and started at midnight. We first did a 20 mile mt. bike ride, then a 12 – 13 mile kayak (pitch dark), 20 mile mt. bike ride, 25 mile trek (4 7000 ft. peaks) and ended with a 20 mile mt. bike ride. It was a tough race, mainly due to the sleep deprivation. This weekend my friend, David, and I climbed Glacier Peak in the North Cascades. It was over 30 miles roundtrip and we did it in less than a day. This was one of the most brutal days I have had climbing. Today David, Jessica and I climbed the Emmons Glacier route up Mt. Rainier. The weather was great and we moved really efficiently for an 8am summit. Today me and a buddy climbed 3 Fingers (Cascades). It was a 16 mile roundtrip hike with plenty of mountain goats, snowy traverses and a couple ladders at the top to an old fire watch tower on the summit. This past weekend 5 of us climbed Eldorado Peak in the north Cascades. Although not a difficult climb, the summit at (8876 ft), the actual summit ridge is amazing. It is a very steep knife edge to the top with spectacular views of the cascades. So now that the Denali expedition is complete, what is next? 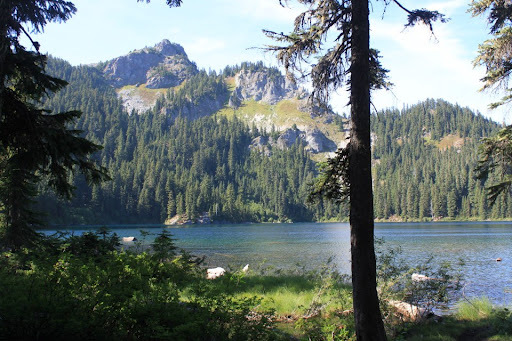 I will continue to hike the local peaks including Eldorado, Hood and Rainier this summer. Right now I am not planning on a winter summit but most likely Elbrus in Russia next year. Elbrus is the tallest mountain in Europe. More to follow. My Denali Expedition is complete. We made it to 19,000 ft. before turning around due to high winds, but we were close enough to see the summit (1000ft). Like I told everyone, the summit is the goal but the experience along the way is the true accomplishment. Never say never, but right now I do not plan on going back to walk the last 1000ft. We had a great team besides one individual that was escorted down from Camp II. Two people died on the mountain during our 3 week climb. And one of our teammates was blown 100ft. off of the mountain on our summit bid descent. The rope team responded quickly in self arresting to save her. As far as I know everyone came down with all of their fingers and toes, so that is a sure sign of success. Seeing my wife and two kids at the airport was the best thing I could ever imagine. I missed them terribly and I am very much enjoying my time at home with them. I have one week to go so I thought I would post the cybercast website just in case I do not have time to get on here before my departure. Denali Cybercast It is the expedition leaving on May 5th. Wish me luck! This weekend I took the Extreme Adventures group up Mt. Rainier (Camp Muir) to snowboard down. The weather was great and everyone had a good time. 2 weeks until Denali. I am continuing my daily climbs and 6 mile runs. Well I am 3 weeks away from my Denali Expedition. I have had a round of sicknesses come through my house but I have powered through them. My workouts have consisted of 3 to 4 60lb pack climbs up the local peaks and 6 mile runs in between. I feel physically prepared for the climb and have all of the required gear. Although I am looking forward to the climb I am not looking forward to being away from my family. I have a satelite phone so at least I will be able to be in contact, but nothing replaces being able to hold and tickle my kids….and wife. Clif Bar delivered their product sponsorhips this week. Thanks Clif! The RMI mountaineering course was excellent. The weather was as bad as we could imagine, which helped in our training. Although we did not attempt the summit, we had plenty of training lower on Mt. Rainier. It was a good opportunity to dialin my gear in preparation for my May expedition. Today I am heading up Mt. Rainier for 6 days to train for my Denali expedition. The training will consist of crevasse rescue, ice climbing, sled pulling, building snow shelters and various other mountaineering skills. If the weather works in our favor then we will make a summit attempt. I will report back after my training. Over the past few weeks we have been building the Extreme Adventures group. We have a good number and will launch our first event the first weekend of March (hiking Mt. Si). Today a buddy and I geared up and hiked the 10 mile roundtrip up McClellen Butte (5162 ft). The weather was perfect and the avy hazards did not give us any trouble. Yesterday a group of us climbed Mt. Ellinor (5944 ft.) in the Olympic Range. The conditions were great except having to park 3 miles from the trailhead due to snow. The climb and view were great but the highlight was definitely glissading down the chute. Today I hiked up to Camp Muir with a couple of friends and snowboarded down. The conditions were epic to say the least. It was a great workout with a perfect ending. We have had some hard weather so far this year. In November we saw some light floods, then the past few weeks we had a ton of snow, which then melted after days of torrential rain. This caused record floods in various parts of Washington. This past weekend I spent some time with Church on the Ridge helping out the flood victims. The river has receded, but it will take some time for residents to get their lives in order. I encourage you to help out where you can. There are many people in need. We have had some unusual blizzard-like conditions here in the Puget Sound the last few weeks. It has been perfect weather to gear up and train on some of the local peaks. My wife and I spoke with our pastor and his wife about starting a church affinity group called Extreme Adventures. The goal is to bring together individuals with similar interests and as an outreach to youth in need of guidance, confidence and direction. We will host a monthly event. The information will be posted on the website calendar. Just a quick update. I am continuing my conditioning with the local peaks. Here is a pic from Mailbox Peak, which is a few miles from my house. Today I signed up for the Denali Expedition with Alpine Ascents International . The expedition dates are May 5 – 25. I have the winter to train, which will include one week of moutaineering school on Mt. Rainier in March. Today I signed up for the Mt. Rainier mountaineering school in March. This a one week school consisting of mountaineer climbing and rescue techniques. It is mandatory prior to my Denali trip in May. I went with RMI (Rainier Mountaineering, Inc.)for this training since the Alpine Ascents class dates are too far out, which would make it difficult to get time off from work. Yesterday I summitted the 3rd highest peak in Washington, Mt. Baker (10,778). A friend and I started at 4am after 3 hours of sleep. It was a long trip for a single day ascent. This time of the year made for a lot of crevasses on the mountain so we had to find safe routes around them. My buddy stopped around 8000 feet so I made a solo ascent to the top. It was a beautiful day, very clear views of the surrounding peaks such as Mt. Rainier and Mt. Adams. This past Saturday I swam and ran in the Alcatraz Challenge. It was a 1.5 mile swim from Alcatraz to Crissy Field then a 7 mile run up and over the Golden Gate Bridge and back. It was an amazing event and an amazing experience. The currents were a little different than normal which made the swim a bit longer. I kept a nice and steady pace and really just enjoyed the scenery. My family came down with me to cheer me on. Plus we extended our trip for a mini vacation. The kids especially loved riding the trolley. Yesterday I met up with a buddy in Portland that I had not seen in 16 years and we made a 1 day ascent of Mt. Adams (12,276). I strapped my snowboard to my backpack and headed up the mountain at 5am. We reached the summit in the early afternoon and I snowboarded down until I ran out of snow. It was a long day but the weather was great, plus there is nothing like snowboarding in the middle of summer. So the first day we hiked from Paradise to Camp Muir. That is 5,000 to 10,000. Starting at sea level (Seattle) we went to 10,000. We were in the clouds that night but in the morning from about 8,000 and up was beautiful. We did some mountaineering training in the morning and that afternoon we packed up hiked across Cowlitz Glacier and over Cathedral Gap to high camp on Ingraham Flatts (11,000). We ate some pasta early then tried to go to bed since we were getting up at midnight to make a summit attempt. Nobody really slept due to either anxiety or comfort. I was not really thinking of the climb too much but it was freezing and I could not get comfortable. I probably got a total of 1 hour then it was time to get up. We had some hot drinks, lightened our packs, put our headlamps on and headed up the mountain. We traversed Ingraham Glacier and straight up Disapointment Clever. Some areas had ropes anchored for safety since the other side was straight down. It is almost better to do that route at night with headlamps so you do not see what you are walking across. The ascent was freezing and windy. The conditions were crazy; they estimated -10 degrees and 60 mph winds. The whole ascent was straight up and in some places knee deep snow. We could see a major gust of wind with flying ice particles come our way and we would hunker down, then take a step forward. For awhile it was 1 step forward to just get blown 1 step back. The sunrise was around 5ish and so beautiful. I pulled my camera out but that and my gps watch did not work because it was too cold. I ended up warming my camera up and got pictures on the summit and the way down. I started feeling the altitude at 13,000 feet, each step became harder, but I kept pushing. We went and went, higher and higher, it seemed like the summit would never come. We would get to what we thought was the end and another major peak was in front of us. Then finally we reached the summit at 14,200. We quickly looked around but it was too dangerous to linger or walk across the Crater Rim to Columbia Crest, so we turned back. We went down about 20 yards and took a quick break before descending. The hard part was certainly not over. Like Ed Viesturs always says, “Getting up is optional, getting down is mandatory”. At high elevation, it is not only extremely hard to breathe, but to eat or think clearly. Mt. Rainier certainly is not as high as some of the other major climbs I will do but the unique thing about this one is that you gain a lot of altitude quickly with little time to acclimate. The altitude really did not affect me too much, so I was pleased about that. After our break we put our packs on and started our descent. It was ultra steep coming up so you can imagine going down. However you regain the much needed oxygen as you pass the different elevation levels. We walked across an ice bridge that covered a 1000+ foot crevice in a glacier. It was barely wide enough to walk across and they figured it would break in the next few days (did not see that during the night ascent). We made it to high camp and all pretty much collapsed in our tents. However we had to get up quickly to pack and head down. We then went to Camp Muir to grab some other gear and fill up our water bottles then headed down to Paradise. So we went from 11,000 at midnight to 14,000 back to 5,000. It was quite a day and it felt nice to be in the van heading back to Seattle. As we drove we had plenty of views of Mt. Rainier. It was amazing to think we had just been standing on the summit a few hours earlier. Training continues. I am one week away from attempting Mt. Rainier. I have all of my gear and have been hiking and running most days of the week. I mainly train early in the morning or during the kids naps as to not take time away from the family. The Big Sur Marathon was outstanding. They really did a great job putting it all together. I completed the race, not the time I was looking for but I started cramping at the mid-point and slowed my pace to avoid injury. All and all it was a great experience and a good goal to accomplish. You can see me at the start of the race on various websites. Now it is time for some serious heavy load hikes to prepare for Mt. Raineir at the end of this month. So check this out. Yesterday I went for a quick 9 mile run before church. It so happens that there was a race going on in my town. So I am just running with the people and passing everyone on this 1 mile stretch (I was already 4 miles into my run). There was a place on the road where the race continues on a back road to North Bend, but that is where I was turning to take a different route to a park with a .75 mile track where I do a couple laps then head back to round off 9 miles. Well I guess the racers thought I was in the lead and followed me the wrong way. I didn’t realize it since I was pretty far ahead of them and when I was on the track I noticed a line of racers heading down the wrong way looking a bit confused. Oops….my bad. Still pretty funny if you think about it. Rappelling up on Mt. Si a few years back. With the Big Sur marathon only a month away I have really increased my running. I am trying to do a 9 mile plus a couple 6 mile runs a week. I just hiked Tiger Mt with a full pack and my new double plastic boots this morning. My body is certainly recovering from the long distance runs but I am feeling great. As I prepare for the summits I am trying to do weighted hikes up local mountains like Mt. Si in North Bend. I also snowboard, rock climb, mt. bike and rappel. I have a hard time staying motivated indoors so even if it is raining or snowing I would rather train outdoors. I signed up for the Big Sur marathon in April as well as the Alcatraz swim and race across the Golden Gate bridge in August. My goal as it stands now is to hike Mt. Rainier this year then Denali next year. That will be a good summit to help prepare me for Everest. I would like to do Everest in 2010, but it will depend on money and my work schedule. I am signed up to hike Mt. Rainier in May with Alpine Ascents. It is a 3 day hike to the summit at 14,410 feet. I have been doing a couple local hikes with a full pack to start my training.